1. There is little modeling work for children. 2. Location is extremely important. 3. Do not pay upfront fees. 4. Success rate must be determined. 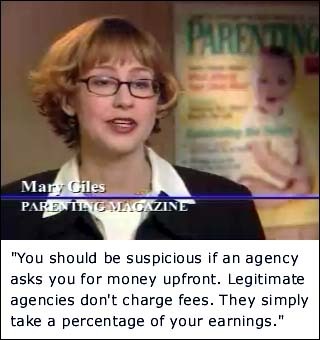 Karen Hensel, "Model Behavior: Don't Get Scammed by Modeling Agencies," I-Team 8 Investigative Report, WISHTV [Indianapolis], n.d.
"Can My Child Become a Successful Model?" New York Institute of Photography, Oct. 1997. [Sept. 20, 2004]. "Everyone says your baby is beautiful. You think they're just being nice, but after even strangers insist, "Your baby should be a model," you start to think that maybe they're right. Perhaps your child's sweet smile could even fund her college education. But you don't know what's involved or whom to call. We went to the people who work at some of the country's top modeling agencies and asked them a few common questions..."
"Of course your child's cute -- but could he or she be a model? Here's a behind-the-scenes peek at what it really takes to be picture-perfect. . . . Flip through any magazine, channel-surf on any given night, even drive by any stretch of highway billboards, and there they are: adorable, wide-eyed babies showing off the latest in kiddie couture or helping hawk everything from juice to Jeeps. If you're like most parents, the sight of these pint-size models inspires three responses: first, "Awwww! "; then, "My kid's cuter! "; and, finally, "How can I get my child a job like that?" "The Phillipses, Wojciks and Bristols all sued and won back the fees." Kids.com LLC sends unsolicited letters to parents in which they state: "Your child was recently brought to our attention." News Anchor: "How are they finding the kids to start with?" 1. Radke, Kleinschmidt and Colston vs. Kids.com, LLC, d/b/a Kids.com, ¶10. 2. "I-TEAM Investigates Kids.com," I-TEAM, WCCO, Feb. 16, 2004. 1. "Child models checks shock," Manchester Evening News, Mar. 1, 2004.